Is your snoring making your bed partner miserable? Do you wake up feeling as though you are not rested? Snoring can be a sign of sleep apnea but not all apneic patients snore nor are all snorers apneic. CPAP machines are quite effective but are poorly tolerated by many patients. Dr. Pohlhaus has undergone specialized training in the dental management of both snoring and sleep-disordered breathing. Here at the Baltimore Center for Laser Dentistry we offer many services for patients suffering from snoring and sleep apnea. 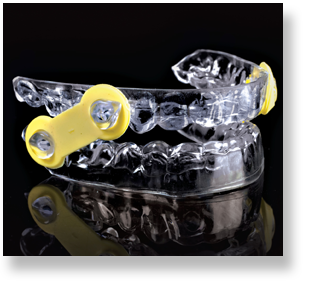 Oral Appliances- for treatment of sleep apnea and snoring. We provide a variety of devices as patients needs vary. Our office is a Medicare Participating Durable Medical Equipment provider. Pharyngometry and Rhinometry – Advanced imaging devices to measure the size and stability of the nasal and oral airway. If your screening tests indicate sleep disordered breathing we can refer you directly to a certified sleep center or to your primary care physician. Sleep Apnea is a serious condition but the good news is it can be treated leading to greater health and quality of life. Oral Appliances pull the lower jaw forward to increase the size of the airway.